Are you a mountain biker looking for a high quality CamelBak with hydration system? We’ve talked experienced bikers to find out which CamelBak is the best pick (and tested few ourselves). We’ve compiled a list of best CamelBak hydration packs for MTB based on our interview with 3 experienced bikers. We’ve selected the most durable, quality and ease of use while riding to help you make the right choice. If you’re looking for a quick, sure-pick, take a look at our CamelBak K.U.D.U 18 model review. It’s a 18L campacity backpack with Impact Protector technology which absorbs multiple impacts and crashes to make your ride more comfortable. Another K.U.D.U benefit bikers love is its ventilated back panel for less sweating during summer rides. If you’d like to do more research, read our reviews one by one or see our full buyer’s guide. 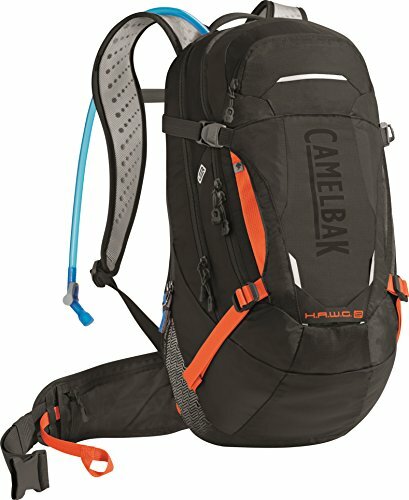 Which is the Right Hydration Pack For Me? Finding the right type of hydration pack for you isn’t that big of a problem since all the packs are designed for different activities which divide them into five different sections. You can learn more about different types here. 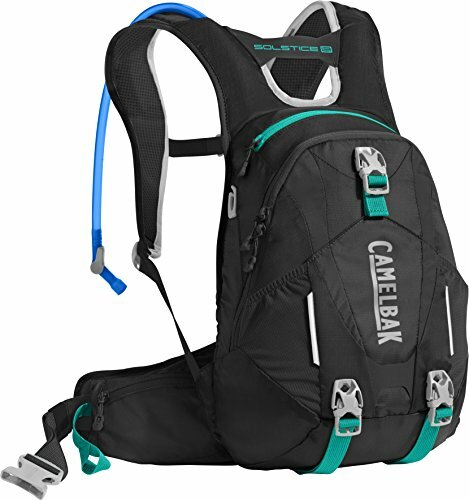 Do I Need to Use CamelBak? No, there is no necessity to use a CamelBak on short, everyday rides. But most cyclists suggest the use of CamelBak on longer rides. CamelBak isn’t better than water bottles, but it’s more practical. If you tend to carry a lot of stuff on your rides, the K.U.D.U. 18 would probably be the best choice for you with its 18L capacity. It is also available in a smaller form with 12L capacity, but we’ll get to that later. One of the best features is the Impact Protector™ that absorbs multiple impacts and crashes which are frequent in mountain biking. This protector is made of lightweight and flexible foam, designed to move with your body so that you can feel comfortable while being protected. When it comes to long races, the 3L reservoir and big storage capacity should be just enough. What I also love is the rain cover that pops up to shield your equipment which is particularly helpful when the weather is unpredictable. The back panel is ventilated and has improved temperature regulation, but due to its size and especially when stuffed with all the things you catty on your rides, it can feel quite hot on your back which isn’t an issue in winter but can be quite uncomfortable in warmer months. The pack comes with a bike tool organizer roll designed to fit perfectly in its cargo space and it is very practical so that you’ll always know where your tools are instead of digging through the full 18-liter pack. If the size and weight of the full pack concern you and you believe that it might fall off of your back, you shouldn’t worry. The pack features the load-bearing waist belt, two sternum straps, and yoked harness that makes sure that the pack stays on your back through the whole ride. Overall, this is an amazing hydration pack for long, risky winter rides, with great protection. CamelBak K.U.D.U. 12 is a slightly smaller version of the previous model we reviewed. Just like its “big brother” it was designed to fulfill your needs for hydration, storage, and protection during long-distance races. If you are a rider who likes to push limits, you’ll be happy to know that K.U.D.U features an amazing removable impact protection that protects you due to falls and crashes, which are quite common in mountain biking. It protects you from back and spine injuries better than most of the other packs that offer protection. 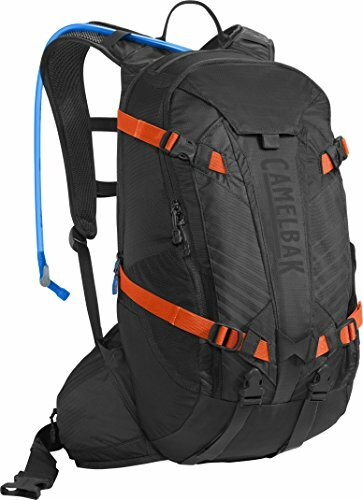 It also features Camelback’s Antidote reservoir with 3L capacity with a wide mouth that makes it easy to fill and to clean. It also includes a tool roll, a lined pocket for glasses, internal organizer mesh pockets and big storage for anything that you think you might need on those long rides. Even though it is smaller than K.U.D.U. 18, this smaller version is not so small, however, you shouldn’t worry about it falling from your back or being unstable and uncomfortable because it features excellent waist belt and solid shoulder straps that keep it in place at all times. And while the pack is nearly perfect, there is one downside to it. The addition of the protective inserts does add a little weight to this already bulky pack that will probably be stuffed to the top for every cycling adventure. While listed as mountain biking pack, M.U.L.E. is so much more than that. It is very versatile and can be used for a lot more than just mountain biking. It is very comfortable with a lot of storage space without being too big and inconvenient for some other activities like hiking or even as a travel bag. It is big enough to carry 3L of water in the zip-opening container that keeps water cool enough even in very warm days, and the entire gear one might need on the biking adventures, but lightweight and easy to carry. The organization is fantastic. Besides the main compartment, there is also a stretch pocket in the middle which is convenient for packing gloves, hat or whatever you want to have quick access to. There are also a couple of zippered pockets –a smaller one for your phone, tissues, and small stuff like that and a bigger one divided in compartments practical for energy bars, vitamins, and other small items that you don’t want to “lose” in the pack. While more compact than two previously reviewed models, M.U.L.E. still isn’t quite a small pack, that’s why it is great that its back is padded with segmented channels which allow airflow and keep you and your back cool. Well, not cool, but cooler. Overall, the CamelBak M.U.L.E. is a very good hydration pack and could be a good choice for those who want a versatile pack. This 20L mountain biking pack features 3L water bladder and storage space of 17L which makes it pretty big, and that is great for those of you who like long-distance races. It is especially convenient for winter rides when you want to carry an extra layer, spare gloves and all the things that you could need on rides like that. If you are wondering what the LR stands for, it is Low Rider. Now, what does that mean? It actually refers to the squat-shaped bladder inside the base of the pack. Talking about the bladder, I should mention that it features the magnetic clip which holds the mouthpiece in place and also a wider tube that allows more fluid with each sip. Due to its shape, the bladder is very easy to fill with water and clean. The pack has a few zipper pockets that make organization easier as well as easy access pockets on the hip strap. I like to call them emergency pockets because you can put in them anything you want quick access to without having to take the whole bag off of your back. The bag itself, even when empty, isn’t quite lightweight. It alone weights 1kg which is about two pounds. Now add all the stuff to it… not very light. However, as previously said, despite the weight, the pack is very comfortable so this shouldn’t worry you. The pack also features very useful rain and mud cover that helps to keep your gear dry and clean. Offers a lot of space for tools, spare tubes, extra layer etc. The overall 10L Solstice pack is capable of carrying 7L of cargo and 3L of water which is very convenient without being overly bulky. The shape is specifically designed for women, including the S-curve straps for more comfortability. It also features foam pads that provide more comfort and airflow between your back and the pack. It is very well built, durable and perfect for all-day mountain biking. It features a fancy organized tool, suitable for tools, energy bars, first aid kit and anything else that might be needed for the long rides. One of the greatest things about this backpack is probably the ease of adjustment of the fit without even stopping your bike. Why is this such a good feature? Well, as you drink the water from the water container, the pack becomes more lightweight and loose so you might need to adjust it from every now and then and you certainly don’t want to stop every time just for that. That’s why the pack was designed with easy to tighten straps. The outside of the pack is as thoughtfully designed as the inside. It features stretchy mesh pockets convenient for overflow storage as well as compression straps and helmet hooks. The water container is very easy to fill and clean but it is also very easy to dry out too since the hydration hose can be unclipped without spilling any water even if the container is full. The pack features N.V Back panel which is an air flow channeling system, made of perforated foam panels covered with a light mesh. This is very convenient, especially if you like long rides on warm, sunny days. It provides improved air circulation, but that doesn’t mean that it will save your back from sweating during challenging rides. If you look at the bottom of the back you’ll see a high-viz rain fly hidden there that besides keeping your gear dry also makes you safe while riding at night, thanks to its bright, reflective colors. The pack is so durable that it can, not only survive daily rides in all conditions but actually continue looking brand new even a year later. The shape of the pack is ideal for women, which you might assume from the table, where it was already listed as woman’s hydration pack. That means that it is a little shorter in overall length than a unisex pack and it has repositioned s-curved straps which makes it more comfortable for female anatomy. In fact, a lot of women said that it fits exceptionally comfortable and if you ask me, that is the most important thing of all. What Types of Hydration Packs Exist? Finding the right type of hydration pack for you isn’t that big of a problem since all the packs are designed for different activities which divide them into five different sections. The running hydration packs are, obviously, designed specifically for running. While shopping, you’ll be able to notice that some of these are called running vests, and the others are called running backpacks. I don’t know how but some people find it difficult to find a difference, so I’m going to introduce you to both of these packs. As you probably assumed, running vests are designed like a vest and fit tightly to your body. The only way that they are similar to a backpack is in that they are carried on your back, and over the shoulders but they feature a lot more pockets on the front of the shoulder straps, which gives them the look of the vest. A lot of these packs include spots for water bottles on the front part of the straps. On the other hand, running backpacks look a lot like a backpack that you’d take on a hike but includes some running-specific features, such as a low-profile design, a hip belt and a lot of easy-access pockets. They usually provide more storage than vests, but don’t have any pockets on the front. However, the big capacity makes them a good choice for long runs that you’d want to bring lots of extra food and clothing. Almost every running pack features a hydration reservoir for easy sipping on the go or at least a possibility to add one that should be bought separately. The hiking hydration packs look a lot like standard packs designed for hiking and normally feature enough space for food, additional clothing layers and the essentials that you probably carry on every hiking. Size wise, they range in from small packs designed for short hikes to those that are big enough for long hikes and camping. The cycling hydration packs are designed for road cycling and mountain biking lovers. If you are more of the road cycler you should go for a more compact and low-profile pack that feels light and comfortable, yet stable on your back without creating too much of wind resistance. However, if your passion is mountain biking the right choice for you would be a bit larger pack that accommodates additional gear, clothing layers and all bike tools that you might need. All cycling hydration packs feature a waist belt that fixes the pack on your back and actually makes it more comfortable without interfering with your pedaling. If you are more of winter sports person, snowsports this hydration packs is the one for you. These packs are designed for activities like skiing and snowboarding, and they help keep your water supply safe from freezing. That means that there has to be insulation on the reservoir and drink tube. There are even some snowsports-specific packs that include carrying straps that allow hands-free transport of a snowboard or skis, making your winter vacation even more comfortable. As you could probably assume from the name alone, these packs are designed to carry around your waist. Most of them include water bottles instead of a reservoir and a really small cargo space. These aren’t designed for long hikes or cycling rides, but for light and fast adventures, especially in the summer when you don’t want to carry anything large that could make you hotter on an already hot day. It could be an ideal choice for a light hike, trail run or cross-country ski where you don’t have to carry a lot of gear. Choosing the right hydration pack is crucial because that pack will be either your best friend or your enemy on all of your cycling adventures. Therefore, you should really get the perfect one in order to fully enjoy your rides. As always, we are here to help you make the right decision by pointing out all the important things to look for when deciding on a mountain biking CamelBak. There can be many differences between two water reservoirs like size, shape, rigidity, ingredients feature and more. They may as well have different fill and closing mechanisms. When it comes to these things you should simply choose what you are more comfortable with. Softer reservoirs that hang on the hook holders certainly take up less space than those rigid ones, but that definitely doesn’t mean that they are better. As long as you decide on a safe one (ingredient-wise) you can choose any shape you like. There is also the water capacity that needs to be considered and that depends simply on two things: how long is your ride going to be and how much water do you usually drink. If you like both long and short rides, I would recommend getting a larger container, because you do not need to fill it up completely, but can carry more water if needed. Water reservoirs usually come in one of three sizes: 50oz (1.5L), 70oz (2L), or 100oz (3L), though the smallest size isn’t very common, at least not anymore. Some packs come without the reservoir, but with the possibility to add one, so if that’s your case, make sure to check what bladder size is it designed for. Keep in mind that sometimes it is possible to make a larger-than-intended reservoir work, but if that’s what you are hoping for, don’t shop online. Instead, you should go to the store, with the pack and try out and see which bladder works the best. If you ask me, I would always get the bigger one. However, if you are trying to carry as little weight as possible, then you should go for the smaller one. Once you are sure about the water bladder, you can move on to a next concern which is storage capacity. Ideally, the pack should be designed to be compact but to offer a lot of storage and that is, of course, very rare. Therefore, try figuring out how many things you want to carry on your rides. If you are more likely to go on long rides and enduro races, big storage is a must, especially in winter. The longer the ride, the bigger the storage. On long rides you will need an extra layer, more snacks (energy bars, nutrition bars etc. ), let’s not forget that we are talking about mountain biking here, so it means first aid kit too, a pump, spare gloves, of course, more water, and so much more. So, yes, long race – big pack. However, if you are more of a short ride person, you will only need to bring some necessities, therefore, you might want to look for as small and light pack as possible. It is also very convenient when a pack has more compartments, especially divided ones that provide good organization. This is extremely important because if the pack doesn’t fit properly, you will most likely throw it away in the middle of a ride. Well, maybe not in the middle, but you will get very annoyed with it and it will end up in a bin eventually. The pack needs to be comfortable and to contour your back so that you would forget that you have it on your back. That’s how it is supposed to fit. There are a few different styles and shapes of the pack and choosing one depends only on what feels the best on your back. That’s why I never recommend purchasing online. Other than shape, you should look a pack with a chest strap and hip belt that are designed to customize the fit and keep the pack from bouncing around as you are riding. The bag really needs to stay put while you are on the motion. Some hip belts feature small pockets which are very convenient for easy-access essentials that you want to reach during the ride without having to take the backpack off of your back. Packs that are labeled as LR (lowrider) are designed for you to carry the weight on the lower back rather than higher on the mid-back which is a great option for those with back issues. Why is this important? You know how men’s and women’s body are completely different therefore men’s shape won’t be comfortable for women and vice versa. Packs labeled as unisex are designed to fit both genders, but women with outstanding curves probably won’t find any of those comfortable. That’s why women’s backpacks are slightly shorter, have shape adjusted to their anatomy and feature s-curved straps to fit their bodies. That, of course, doesn’t mean that just because you are a woman you’ll need a women’s-specific pack. Again, regardless of gender, it would be the best to try out a pack and make sure that it is comfortable with making a purchase. Not every hydration pack is waterproof, and among those that are some are more waterproof than others. There are also packs that include a waterproof cover which is a great accessory for rainy days especially if you are carrying some sensitive equipment like camera, phone, tablet etc. As I was preparing for an all-day endure race, I really needed a pack that will be comfortable to wear and get away while riding. I spoke with some more experienced bikers and most of them recommended CamelBak K.U.D.U. 18. The first time I tried it out was while training for the race and I got used, to it so fast that I stopped noticing that I’m wearing it. The second ride with it was at the actual race and I’m happy to tell you that I didn’t have any problems with it. It is very well designed, every detail is well thought out. It features perforated padding on the shoulders for more comfort, quick access hip pocket and so much more. 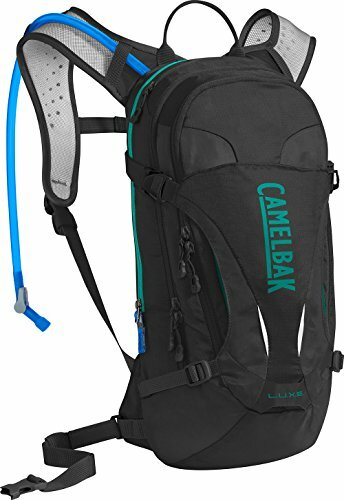 I never make a purchase until I’m completely sure so, as usual, I did a full research before I made the decision to buy CamelBak L.U.X.E hydration pack. I’ve had it for almost six months and I haven’t regretted buying it, not even once. The pack feels light and comfortable which makes it easy to carry on long rides even when it’s full of stuff. It is listed as women’s pack but I don’t see any reason why a man couldn’t use it. In fact, my husband borrowed it for one of his cycling rides and had equally great experience as I did. There is simply nothing I could complain about when it comes to this pack. I highly recommend it. If you are a passionate mountain biker, one of these packs will definitely improve your riding experience and make each adventure a lot more comfortable. There are so many choices, but we narrowed the list down to what we believe is the best for mountain biking adventures. Your job is just to figure out what’s works the best for you. If I had to choose for myself, I would definitely go for the CamelBak K.U.D.U. 18. I absolutely love the protection feature and the huge storage. However, everyone’s needs are different and if that isn’t your number one choice, I’m sure you’ll still find a perfect hydration pack for you in our top six list. I hope we helped you make the best choice! Tijana is a copywriter and a fashion designer. She has years of experience in testing & reviewing products.